NEW YORK, NY--(Marketwired - September 27, 2016) - DJI unveiled its newest drone today -- the Mavic Pro ($999). 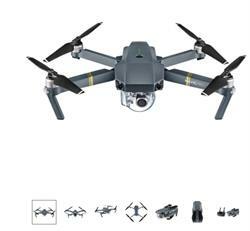 It is portable, lighter, and less expensive than DJI's flagship Phantom drones -- all while retaining the performance and high-end features users have come to expect from DJI. 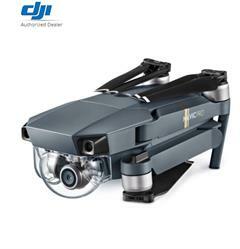 This latest offering retails at under $1,000, and is available for preorder at B&H. The Mavic Pro's portability is its most unique attribute. The props holding the rotors fold in over the body, making the whole unit small enough to fit inside of any ordinary backpack, or even a purse. Despite this, the drone does not lose any of the DJI's common top-line features like front and bottom sensors, obstacle avoidance, subject tracking, autonomous landing, and stability indoors without GPS. The remote has also been shrunk, as it is now approximately the size of an NES controller. Users also have a less expensive option to forgo the remote altogether and use their smartphones instead. The camera shoots 4K video at 30 fps, and full 1080p HD at 96 fps. From a photography standpoint, the only drawback is a slight reduction in field of view, shrinking from 94 to 78 degrees. 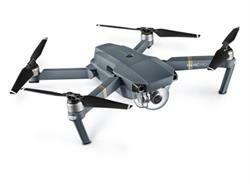 The Mavic Pro actually outperforms the DJI's Phantom drones in a few ways, including a live video streaming range of 4.3 miles, compared to the maximum range of 3.1 miles on the Phantom 4. The new drone can also stream 1080p video to social media platforms like YouTube, Periscope, and Facebook, compared to the 720p video on the Phantom 4. Finally, the Mavic offers gesture control -- a new feature not seen before in the Phantom series. "DJI has spent a decade making it easier for anyone to fly, and by rethinking everything about how a drone looks, we have created an entirely new type of aerial platform for anyone to explore their creativity," said Frank Wang, DJI's CEO and founder. "Mavic Pro is a technological triumph filled with features that once again show how DJI leads the industry." B&H is also offering the Mavic Pro Fly More Combo Kit ($1,299.00) which includes two additional flight batteries (three total), two additional propeller pairs five total), a Battery Charging Hub, and a Shoulder Bag to carry the Mavic around in. The drone features an advanced flight control system that draws on a host of sensors - including a ground-facing camera, ultrasound, GPS, dual redundant IMUs, and more - to keep track of where it is flying in 3D space and even avoid collisions. The Mavic is DJI's first compact, personal flying camera. Ultimate image quality and ultimate portability combine in one revolutionary device that will stay with you, whenever you need it to capture that sudden burst of inspiration. Fly with simple tap-based commands, and the Mavic can even recognize gestures for the perfect selfie. The Mavic works in tandem with DJI's GO mobile app for accessing settings, getting a telemetry readout, viewing a low-latency video feed, and even editing and sharing your footage.